With slim televisions ruling the roost, there is lesser room for inclusion of decent speakers on most of these TVs. Thus the sounds you get from speakers of the TV do not feel satisfying and lack in viewer experience. And if you do not have the requisite amount of dough to spend on a full 7.1 home theater system, a very good alternative is Bluetooth speakers from Bose, the premier sound specialists for decades. 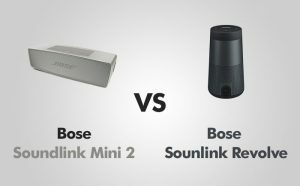 In this comparison, I will compare two popular Bose products; The Bose Soundlink Mini 2 and the Bose SoundLink Revolve. We will take a look at different aspects like the design, features, build, and the ease of installation and of course the sound. In the end, we shall also examine the pros and cons of each device so that you can make an informed decision about choosing the best speakers for $200 amongst them. So let’s jump right into the review. With sound solutions, the design is not as important as is the performance, but it still matters. And with Bose, one expects better than average design anyway. Let us take a look at the two. Exceptionally well built, the 2.3”X 7.1” SoundLink Mini 2 is rugged, and it also features a physical control panel on top which is in rubber. You have the standard buttons like power, Bluetooth, battery level indicator and volume controls. Weighing in at about 0.68 kg, the SoundLink Mini 2 feels sturdy and solid, but it is not water resistant or shockproof. Made of aluminum and rubber, it feels cold to the touch and looks extremely classy. There is the standard aux input in the 3.5 mm jack as well as the regular USB connection that you can use. Bose claims up to 10 hours of playback on a single charge on the wireless docking station. As well built as any Bose flagship product, the 3.24”x 5.97”Soundlink Revolve comes in an aluminum casing with the top of the device sporting the control buttons. Here too, you find options like power, volume controls, and a Bluetooth and battery level indicator. It weighs 20 g less than the Soundlink Mini 2, which is not much. It is water resistant, so if you accidentally spill a glass of water over it, not a problem. In addition, it is highly shockproof and there were no dents and scratches even after a number of drops on the granite floor while reviewing. It has the same 3.5 mm aux connection and USB connection options as the Soundlink Mini 2 and offers 12 hours of playback on a single charge on the docking station, which is not wireless and has to be bought separately. There is a battery level indicator to warn you when it reaches low battery, and the Bluetooth signal is good from the edges of the recommended range of 30 feet. The SoundLink Mini 2 can play music separated into the left and the right channels and that is a plus for music fans who want depth and detail. As it easily fits into a backpack, this speaker is ideal for personal use on a trip out of town as well. There is no NFC connectivity, and you do not have the Bose app to control the settings on the Soundlink Mini 2 from your smartphone, because it is technically an older generation speaker. The SoundLink Revolve is the more portable amongst the two speakers and offers 360 degrees of sound output so that it can be placed anywhere in the room and deliver the same quality of music. The battery level indicator lets you know how much juice is left at any given time and the Bluetooth works well within the range of the recommended 30 feet. The best feature of this speaker is that it can be paired with another of its kind and made to separate the sound into the right and left channels, or alternatively play the same music in different rooms seamlessly and in sync. The mobile app helps you to fiddle about with the controls and that is a huge plus and an area where the Soundlink Revolve scores above the Soundlink Mini 2. When playing sample music on it, this speaker gave us great depth, high fidelity, and rich sound, which are the trademarks of Bose. The lower frequencies were well represented, and there was a faithful reproduction of the mid-range as well. But the high frequencies were a touch damped. However, for personal listening purposes, this speaker does its job extremely well, having separate channels for left and right. It gives you enormous satisfaction when it comes to the sound. Being best suited for events, parties, and gatherings, the sound comes into its own as music is dished out evenly in all directions. Compared to the SoundLink Mini 2, it is better with bass, the midrange is well mapped, and the high frequencies are also quite well represented, providing you with a very good listening experience. 100% of volume on the Mini 2 is equal to 70% of the volume on the Revolve, but there is a bit of loss in fidelity and richness when compared to the Mini 2. PROS: Refined music / Good power considering it is a small box / Wireless charging dock / Left and right channels present. PROS: 360 degrees sound output / Water resistant / Shock resistant / Goes a long time on a single charge / NFC is present. CONS: There is no NFC / It’s not shock resistant or water resistant / Could have been louder. CONS: Charging is wired / The output sound is not as rich and does not have great high fidelity. The Mini 2 and the Revolve are both premium offerings from the house of Bose. The Mini 2 is best suited for a close, personal use, and is for the music enthusiast who wants a rich listening experience. The Revolve is great for gatherings, and its higher output makes it a great companion for a hangout session with friends and family.